Dr. Reddy is a board certified physiatrist who practiced with an orthopedic group for over 11 years in Ocala, FL after her residency. She has focused and dedicated her practice to providing comprehensive non-operative orthopedic and musculoskeletal care treating disorders of the spine and joints related to injuries and/or degenerative arthritic conditions. Her interests include caring for patients with spinal, shoulder, knee, hip and other joint-related acute or chronic painful conditions, orthopedic rehabilitation, occupational/work injuries, motor vehicle accident injuries and sports medicine. Dr. Reddy grew up in Michigan. She pursued her undergraduate degree at Michigan State University, graduating valedictorian with a Bachelor of Science in Physiology and Psychology. She attended Wayne State School of Medicine, graduating with high honors. She completed residency and served as a chief resident specializing in Physical Medicine and Rehabilitation at William Beaumont Hospital in Michigan. She was board certified in Physical Medicine and Rehabilitation (PMR) in 1999, ranking #1 in the nation on her board certifying exam in PMR. She was the recipient of the Elkin’s Award for this distinction. 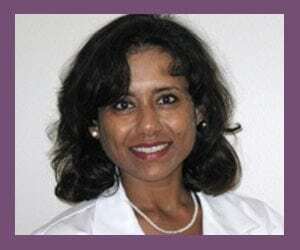 She is sub-specialized and board certified in Electrodiagnostic Medicine (EMG and NCVs). This type of testing helps the diagnosis of muscle weakness, numbness, tingling and neuropathic pain and helps guide treatment of peripheral neuromuscular conditions such as carpal tunnel syndrome, cubital syndrome, and radiculopathies.